Abstract. 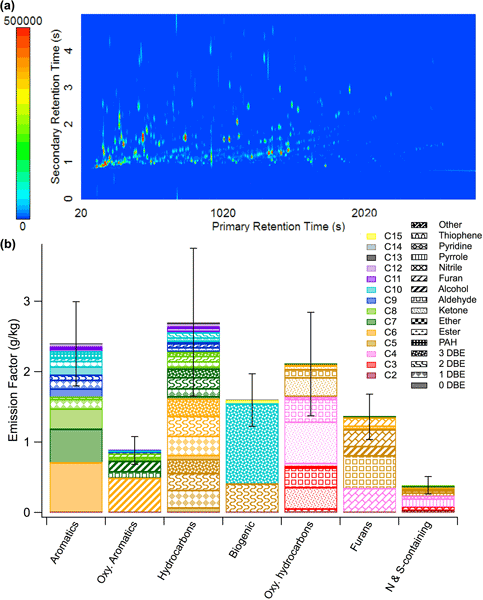 The current understanding of secondary organic aerosol (SOA) formation within biomass burning (BB) plumes is limited by the incomplete identification and quantification of the non-methane organic compounds (NMOCs) emitted from such fires. Gaseous organic compounds were collected on sorbent cartridges during laboratory burns as part of the fourth Fire Lab at Missoula Experiment (FLAME-4) and analyzed by two-dimensional gas chromatography–time-of-flight mass spectrometry (GC × GC–ToFMS). The sensitivity and resolving power of GC × GC–ToFMS allowed the acquisition of the most extensive data set of BB NMOCs to date, with measurements for 708 positively or tentatively identified compounds. Estimated emission factors (EFs) are presented for these compounds for burns of six different vegetative fuels, including conifer branches, grasses, agricultural residue, and peat. The number of compounds meeting the peak selection criteria ranged from 129 to 474 among individual burns, and included extensive isomer groups. For example, 38 monoterpene isomers were observed in the emissions from coniferous fuels; the isomeric ratios were found to be consistent with those reported in relevant essential oils, suggesting that the composition of such oils may be very useful when predicting fuel-dependent terpene emissions. Further, 11 sesquiterpenes were detected and tentatively identified, providing the first reported speciation of sesquiterpenes in gas-phase BB emissions. The calculated EFs for all measured compounds are compared and discussed in the context of potential SOA formation. 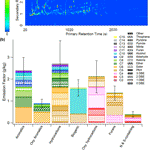 How to cite: Hatch, L. E., Luo, W., Pankow, J. F., Yokelson, R. J., Stockwell, C. E., and Barsanti, K. C.: Identification and quantification of gaseous organic compounds emitted from biomass burning using two-dimensional gas chromatography–time-of-flight mass spectrometry, Atmos. Chem. Phys., 15, 1865-1899, https://doi.org/10.5194/acp-15-1865-2015, 2015. This work represents the first application of two-dimensional gas chromatography to broadly characterize the gas-phase emissions of biomass burning, including comparisons among the emissions from burns of selected conifer, grass, crop residue, and peat fuel types. In these smoke samples, over 700 compounds were detected, which are discussed in the context of potential secondary organic aerosol formation.